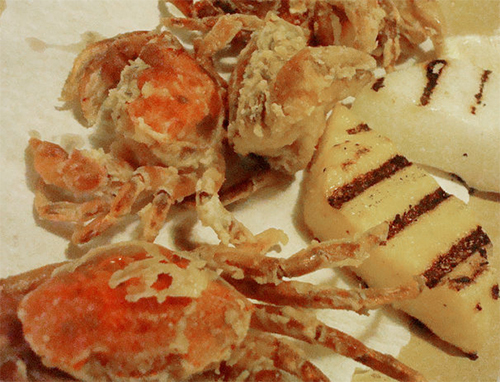 In reality, it is a young crab during the season when they have shed the shell they have outgrown and before the new one is hard, also known as “soft shell crab”. In Venice, whose people have lived on and from the lagoon for centuries, this is another opportunity to enjoy the abundance of their habitat. While I thought this was a simple process, apparently there is a lot of “local knowledge” on how to tell just when a group of crab are about to dispose of their shells. And here is where the Green Crab of Maine comes in. 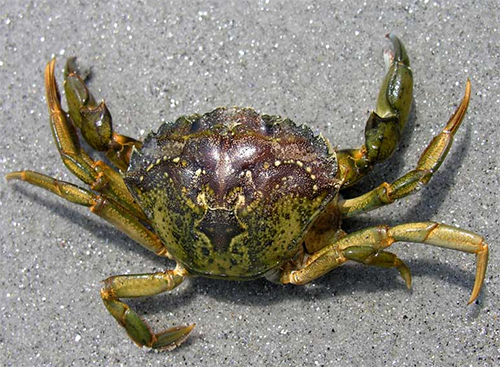 It seems that in New England, a species of crab known as the European Green Crab (Carcinus maenas) entered the US in the mid 1800s on the sailing ships and have invaded the coasts of Maine (and other Eastern Seaboard waterways). The Green Monster or The Munchy Morsel? If life gives you Lemons what do you do? Paolo Tagliapietra, a fisherman from Pellestrina (the long skinny island in the chain of islands that separate the Venetian lagoon from the Adriatic Sea) recently came to the US. 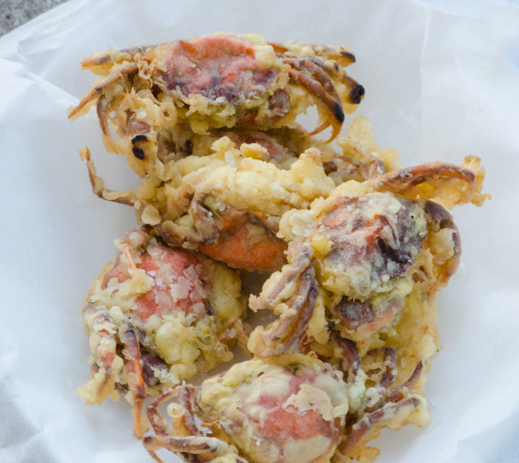 His speciality is knowing when these prolific little green crab with molt and turn into delectable morsels like those we eat in Venice. This unique idea came from a chance meeting of Jonathan Taggart in Venice. The project has not proceeded to far according to Tagliapietra, but what a wonderful way to solve a problem. Moeche with a side of Polenta! ← Drones in Venice, Do you have a Pilot’s License?